In his lab, neuroscience professor Wan-Chun Liu modifies gene expression in songbirds’ basal ganglia, a region of the brain that plays a vital role in early language learning. The work could further understanding of human communication disorders like autism or Huntington’s disease. Liu’s affection for these tiny twittering birds has driven a varied academic career, led him to neuroscience, and inspired a passion for teaching. Liu began his migration through the sciences by studying chemistry as an undergraduate at the National Chung-Tsin University in Taiwan. Flying 8,000 miles from Taiwan to Amherst, Mass., Liu began a doctorate program in biology, focusing his research on songbird behavior. He frequently undertook field work to study song patterns of sparrows and finches in the wild. In the course of his research, Liu’s interests began to shift yet again. He found himself drawn to physiological and genetic questions: how do the birds’ brain structures influence their behavior and ability to learn, and what roles do genetics and the environment play? These questions form the basis of his work to this day — and his experiences as a student have led him to adopt an interdisciplinary approach both to his research and pedagogy. Liu encourages his students — and reminds himself — to examine questions from multiple perspectives and to acknowledge the complex nature of the processes they study together. Colgate’s commitment to the liberal arts dovetails with Liu’s scholarly perspectives. In this environment, Liu and his students approach their research with a creative mindset. 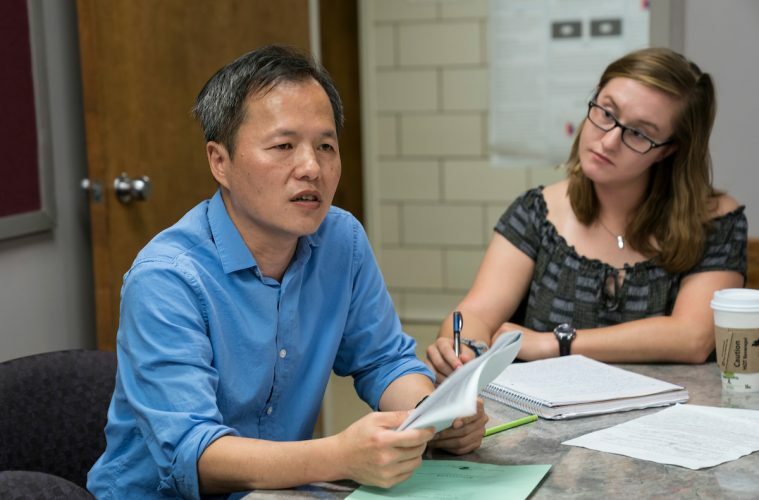 Liu teaches two courses, biological psychology and behavioral genetics, in which he challenges students to weave together knowledge from multiple scientific fields. Sharing his passion with students is rewarding, and he enjoys the “click” when understanding finally hits.